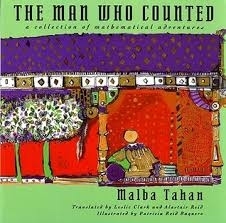 This is a very enriching tale about a gifted mathematician called Beremiz Samir who meets the narrator on a journey and as they travel together, the narrator (who I presume is Malba Tahan) learns about a whole new outlook on life where maths is everywhere. Beremiz solves people's many problems and comes to be known as 'the calculator'. I must admit that the book has some touching parts that really make you stop, lower the book, and just think. One of these parts is when Beremiz enters the cell of the wretched prisoner and finds beauty and wisdom in the rough carvings on the stone walls. He then, with wit, uses his logic to release the prisoner from a dreaded life sentence. Look out for this chapter and read it slowly to enjoy every bit of it. I also very much enjoy the part where Beremiz is able to answer the seven wise men who challenge him to answer their riddles. When you find calculations with numbers, for example when Beremiz tells of the wonderful number 142,857 and what happens when you multiply it by different numbers, then do it in a calculator, or better still by hand! This will make it much more amazing and rewarding for you. This is one of these books that you can read again and again and again and again and again.